Time for dedications to YOUR MOM to go into my book! 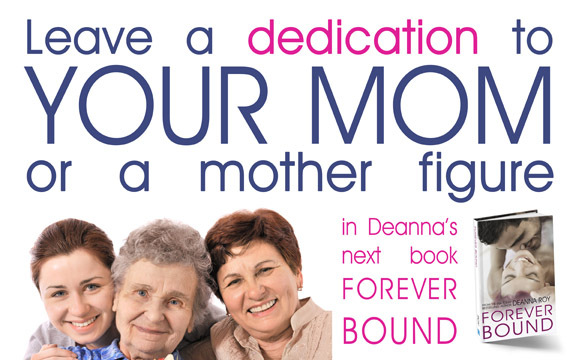 The Facebook fans have decided that the dedications they want to put into FOREVER BOUND will go to our moms and mother figures. Forever Bound will arrive July 28, 2015! The dedications will be in both the digital and print versions, just like in Forever Innocent, Forever Loved, and Forever Sheltered. I think I’d like to have Saving Me by Nickleback sung to me onstage. During her time on earth with us, my mother Verna Flowers, let each of us know how special we were to her. No matter what we did she still loved us and let us know it.